Click here to listen to this sermon as delivered in Nantucket on March 4, 2018. People find wisdom in a variety of places – folk tales, sacred texts, nature, the words of prophetic people, music. I add to that list popular culture – specifically, movies and tv shows – in particular, those I find well written and which speak to something deeper than entertainment: Star Trek, M*A*S*H, and of course, The West Wing. “This guy’s walking down a street, when he falls in a hole. The walls are so steep, he can’t get out. “A doctor passes by, and the guy shouts up ‘Hey Doc! I’m down in this hole, can you help me out?’ The doctor writes him a prescription, throws it down the hole and moves on. “Then a priest comes along and the guy shouts up ‘Father, I’m down in this hole, can you help me out?’ The priest writes out a prayer, throws it down in the hole and moves on. This story helps me talk about my own journey out of that hole – because, to use another movie reference, this time from The Divine Secrets of the Ya-Ya Sisterhood, in the spring of 2004, I dropped my basket. I was struggling to make sense of my life: on one hand, a corporate drone shuffled from Connecticut to North Carolina, working too many hours in a dog-eat-dog world with no release; versus my personal life, a queer, spiritual woman, longing for connection, missing loved ones both alive and deceased, feeling very broken and divided. I was exhausted, trying to balance this divided life. I burned out and fell into a major depression. As I sought treatment and began to look for a way out of the hole, I found many messages about how to become whole again – Madison Avenue and the Self Help Industry told me that wholeness was everything and could be achieved for a price. Yet the more I heard how I had to fix my flaws, the deeper the hole got, and the more broken I felt. This desire for wholeness caused more pain…because like so many of the empty Madison Avenue promises, wholeness – the way it’s sold, anyway – is a myth. So what does that mean for getting out of the hole? If wholeness isn’t the way, what can we do? I know that I was really deep in that hole and had no idea how I was going to get out. And then, someone who had been down the hole jumped in, in the form of a book, The Joy of Burnout, by psychologist Dina Glouberman. In her book, she talks about the physical, mental, and psychological exhaustion that comes from our drive to be everything, do everything, take care of everything, balance everything. But instead of calling us to fix the problems that led us to burnout, she suggests we can get out of the hole by learning from the burnout. Waiting means we have to give up the struggle – take a break – breathe – listen. Waiting isn’t easy. Because in the waiting, still in that hole, things still seem awful and hurtful and empty. We are broken, not whole. We are profane, not sacred. We are ugly, not beautiful. But the waiting gives us time to hear what might help us. I realized my hole was telling me I had nothing, was nothing, and was always going to get nothing. But as I pondered this line, I decided, okay, I’ll show you what I don’t have… and so…I made a list. It started with the pen and pad I was writing on. And then the sofa I was sitting on. And then my cat jumped up, so I added ‘cat’. And then the bookshelf across the room. And the books. And oh yeah, magazine subscriptions. And if I look at the desk over there, I see pens, markers, a computer, a mug from my alma mater. A picture taken with an ex in England. Soon the paper was filled to the brim. I began to sort them out into what seemed like good categories – and I realized that I not only had a lot of what I needed – food, shelter, employment – I had a lot of things higher on Maslov’s hierarchy of needs too – friends, family, hobbies, health insurance, transportation, security. And those things pointed to the intangibles – a sense of humor, an artist’s passion, a love of language, curiosity, compassion, …. and a sense of connection to something… bigger. Something…we might call hope. As she explains, giving up hope is letting go; she says “it is the opposite of hopelessness because it is trusting in ourselves and in what we may be, given half a chance and loads of patience.” It’s about forgiveness and relieving pressure, and mostly, giving up hope for a better past. I gave up hope when I realized I couldn’t go back to corporate America, couldn’t bring loved ones back from the dead, couldn’t change the choices I had made – for good or for ill. I could only learn from what I had done and experienced. I could only “keep the faith” – Glouberman’s third lesson. Keeping the faith is about surrender, deciding that we can trust ourselves and that we are already whole. How can I already be whole? I am a broken mess. I cracked up. I’m full of cracks. And a voice whispered “that’s how the light gets in”… a lyric from Leonard Cohen’s song “Anthem. 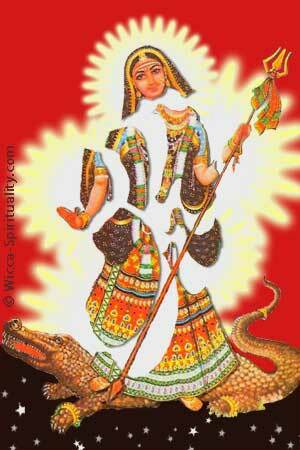 Soon after, I met a Hindu goddess named Akhilandeshvari. “Ishvari” in Sanskrit means “goddess” or “female power,” and the “Akhilanda” means essentially “never not broken.” In other words, The Always Broken Goddess. Akhilanda invites us to make a choice in how to go forward. We gave up hope for a better past, so our stories about the past don’t dictate how we go forward. We are in flux – flowing in new ways, with this incredible opportunity to decide how we want to put the pieces back together. We have the choice to hide the brokenness with carefully hidden repairs and a new coat of paint; or honor the brokenness, like those Japanese bowls, mended in celebration with copper, gold, and silver. Because no matter how we treat the cracks, we get to put ourselves back together in new ways. No matter what anyone else says or thinks about how we are doing it. No matter how many times we are told that we are broken, ugly, worthless – whether from others or our selves. Every broken bit of ourselves is our key to wholeness – full of cracks, and differently beautiful. When I started putting the pieces back together, differently, out of my own divided life, I realized that just saying goodbye to corporate America, to exhaustion and negativity, to North Carolina itself, wasn’t enough. I could do some of this work on my own, but I could not do it all alone. Not just that congregation, not just my family, but in the very totality of life, the universe, and everything – a place of trust, safety, and love, where I can be never not broken. I am whole. You are whole. Holy and sacred, full of holes, and whole. Every single one of us, with the cracks and scars that are evidence of a life lived through grief, trauma, sadness, and illness. Every single one of us, going through things no one else could imagine. Every single one of us, always in flux, always putting ourselves together differently. Every single one of us, with our own stories of how we got out of the hole – every story sacred and valuable and meaningful. Every single one of us, never not broken, but instead called – as always – despite of and because of our cracks – to love anyway. In the blessing of brokenness, we can find a measure of comfort, a call to grace, and joy – joy in having made it out of the hole, joy in helping others out, joy in loving, joy in the very complex, beautiful, brokenness of life itself. We are meant not to be perfectly whole and harmonized, but to be humans in our messy humanness, growing into harmony with the divine and each other. We are human. We are holy. We are whole. Your journey sounds very much like the one that Sarah Ban Breathnach writes about in Simple Abundance!